Portland has such a soft spot in my heart from each road trip we took as a family. Driving nearly 24 hours from Saskatchewan through various landscapes and emerging on the other side of the Columbia River Gorge was wonderful! It still is. This time was different though, as Bob and I took a trip which gave us the best of both worlds – a quick flight into PDX, and a lengthy but enjoyable drive home. Our walk through the Pearl led us to 23rd Avenue, where we settled in at Barista for another coffee, and a rest for our tired legs. 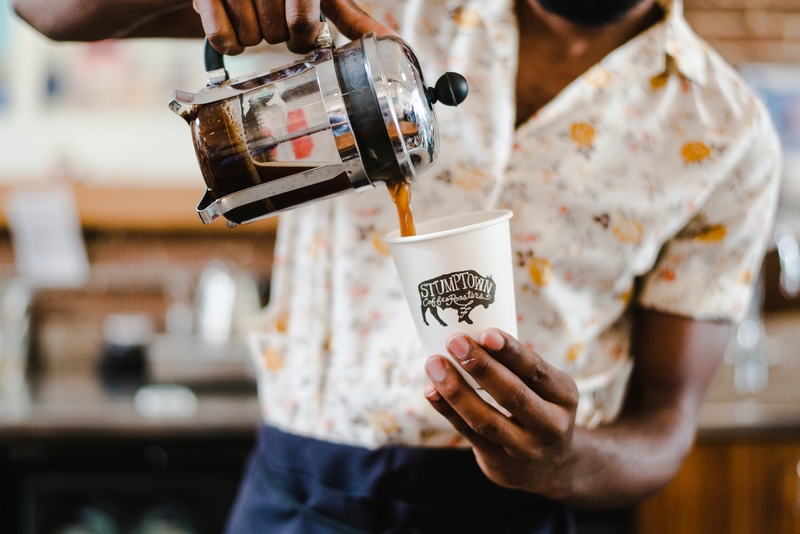 Salt & Straw then enticed us with the best ice cream tasting we’ve ever had. I mean, strawberry jam, Stumptown coffee, almond brittle, and cucumber ice cream, with a side of waffle cone. I could die happy here. Across the street was Bluestar donuts, which we simply couldn’t pass up. (We ate our blueberry bourbon basil doughnut later that evening.) Basically, I’m trying to say that we ate all day. Bob and I both love the city, with the food it has to offer, but we also love getting away from it all. Portland gave us the opportunity to enjoy both to the fullest. We finished off our long day walking in Portland’s summer heat with a relaxing dinner at Tasty n Alder, recommend to us by a friend. Their cocktails were what really impressed me, sipping on the “Rawhide” and “13th Precinct”. Anything with bourbon is good in our books! It was so great to settle in and enjoy a well balanced drink. Our next day full of city adventures led us to Nordstrom Rack where I could satisfy my shoe addiction, following a huge breakfast at La Provence. Our intent was not to shop, so we steered a bit of the beaten path and enjoyed the seemingly never ending Hawthorne district. We stopped first, by chance, at Grand Marketplace. Were we ever glad we did! Aside from the stunning antiques and kitchen pieces we came across, there was a sweet lady who narrowed Hawthorne into “must-sees” for antique lovers. We were thrilled! Unfortunately, the antique mall itself had absorbed us so completely, shops in Hawthorne were closing soon. We hurried out the door and resolved to see as many as we could before closing time, including Lounge Lizard, Really Good Stuff, & Vintage Pink. 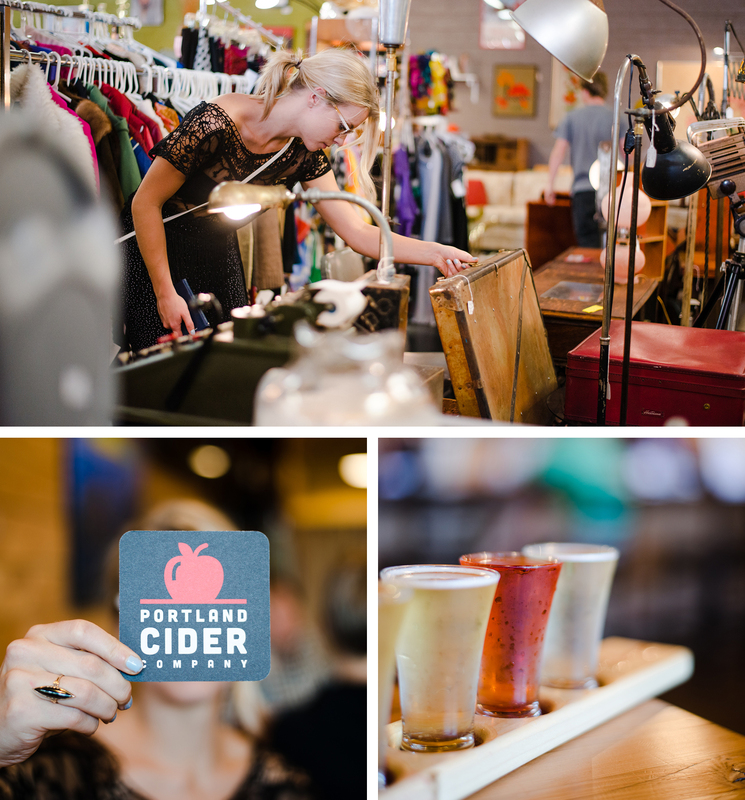 Tired from running around, we refreshed ourselves with a cider tasting at Portland Cider Company. Acai berry and pear were two favorites of mine, but we enjoyed them all, tasting 5 each. Now all that was to be decided was what to eat for dinner – a harder task than you may think. We didn’t want to waste a meal, and after much deliberation we headed to Pok Pok, a Thai restaurant recommended by our friend Celeste. It was everything we wanted and more. I knew that, because I was salivating along with the 20+ other guests waiting for a table. I knew it before we were seated, as we read the menu outside. Before I ordered a drink, before Bob took photos, and up until the moment I had that first bite. The word going around was that it made little difference what you ordered, it was all amazing. This is true. Unless of course, you order 2 out of three dishes to be spicy. I love spice. So much so, that I ravenously dug in, and had to chase each flavor packed bite with bourbon. Do I regret it? Not one bit. It was in fact amazing. Thanks Celeste! 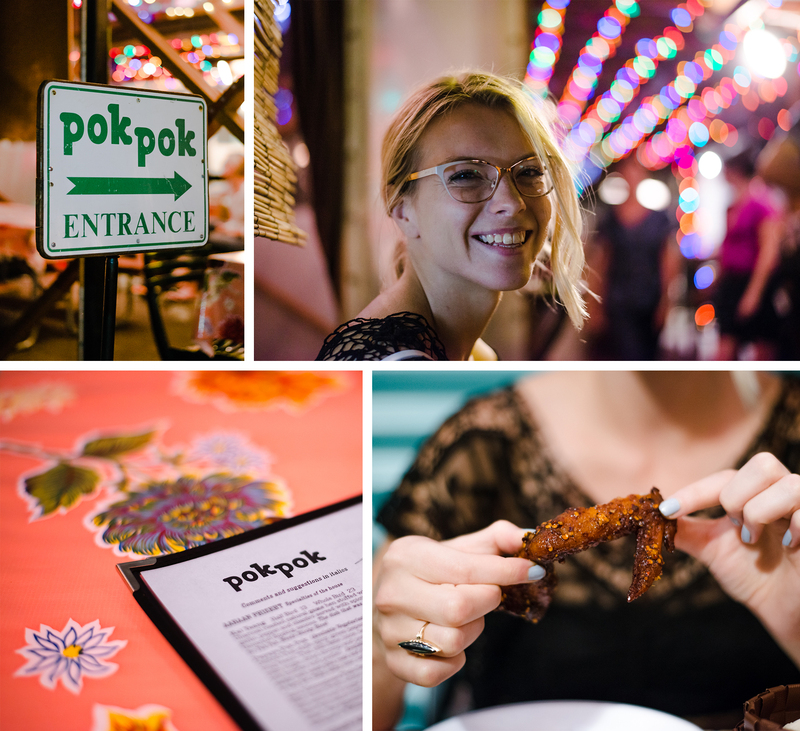 Pok Pok was our last stop in a long day of enjoying Portland’s food and culture. Did I mention devouring our Bluestar doughnut right before we crashed that night? Soft basil notes, understated blueberry, and a little sniff of bourbon – the perfect nightcap. Sigh, I can almost taste it.